It has been more than 24 hours since Turkey shot down a Russian Su-24 Fencer that briefly passed into its territory. Now we are seeing the clear steps Russia is taking in response to this event, and we’ve learned that one of the jet’s pilots has survived the attack, contrary to earlier reports. Make sure to read the article linked below for full context and to get up to date on this fast-moving story. Yesterday, gruesome images of one of the downed attack jet’s crew were posted online by Turkmen rebels and the Kremlin confirmed a Russian soldier was killed by a Free Syrian Army TOW missile attack on Russian Mi-8 Hip helicopter that made an emergency landing. The helicopter was part of a larger force searching for the downed Su-24 crew. We also know that the Turkmen fighters fired on the Su-24 crew as they descended in their parachutes after ejecting. Amazingly, one crew member, Capt. Konstantin Murakhtinhas, survived and is alive and well back in Russian hands. Not only is the crewman alive, but he has since given an interview that you can hear below. In it, he claims that the jet never entered Turkish airspace, that he never heard any of the 10 warnings Turkey claims were radioed over guard frequency, and that they never even saw the missile coming. Meanwhile, Russia has implemented military measures in response to the shoot-down. Just as we predicted, these includes providing fighter patrols to cover attack jets operating in Syria and the deployment of the feared S-400 Triumph surface-to-air missile system. Additionally, Russia’s S-300 surface-to-air missile equipped cruiser, the Moskva, which has been providing an air defense umbrella over Russia’s base near the coast south of Latakia, has been ordered to be at the ready for any potential threats. These measures are not much more than an upping of the Russian threat level towards Turkey and coalition aircraft operating over and around Syria. Nobody is looking to bomb Russian forces in Syria or take our their aircraft while in Syrian airspace, but deploying S-400 batteries means any aircraft operating at altitude within about 250 miles of them will be at risk of engagement. This now means Russia has aircraft operating over all of Syria, southern Turkey, northern Jordan, Lebanon, northern Israel and the eastern Mediterranean under persist risk of engagement. The S-400 system can utilize a quartet of different missiles, with varying ranges and capabilities. Even if the 48N6 missile is deployed instead of the long-range 40N6, Russia will still be able to reach out and engage targets well over 150 miles from the batteries’ firing position. Russia’s proclamation that fighter escorts will be included with all strike missions flown over Syria going forward should mean that we will see more fighters showing up at their base south of Latakia soon. Right now, just four Su-30SM Flankers have been providing defensive counter-air missions and combat air patrols over Syria. 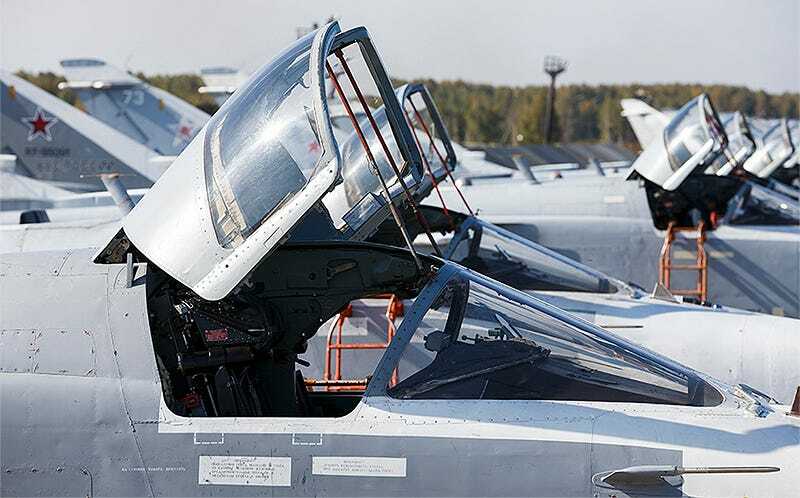 Although this may have been enough inventory to have a pair of jets in the air or sitting alert at all times, they cannot provide anywhere near the aerial coverage needed to support Russia’s roughly 30 attack aircraft and about another dozen attack helicopters while operating at their current high sortie rates. As such, the force will need to be bolstered. No matter how you look at it, this scenario is not a good one for coalition aircraft that fly in Syrian airspace frequently. Having Russian fighters “protecting” their attack aircraft and S-400 surface-to-air missiles on a hair trigger could change the dynamic in Syria’s already crowded and volatile airspace. Also, this incident has not been good for NATO-Russian relations to say the least, which are already in the gutter. The act of taking down a Russian jet while just passing into Turkish airspace for seconds also largely fortified Putin’s claims that NATO is the expansionist aggressor, not Russia, and it will play into anti-Western, nationalist sentiments among the Russian people. As a result, it likely empowered Putin instead of the other way around. Once Russia deploys its augmented air defense forces to Syria, which really have no purpose in the Syrian conflict aside from acting as a reprisal, the U.S. may change its force posture when operating over the country. This could include providing standby jamming support and even possibly F-16CGs in the Wild Weasel role in case Russian SAM batteries pose a threat to coalition aircraft, even if only by accident. This would be similar to the posture the U.S. put to use during its opening strikes against ISIS in Syria . Also providing persistent and dedicated counter-air support is a real possibility. Strangely enough, there are USAF F-15C’s forward deployed to Turkey for just that mission.